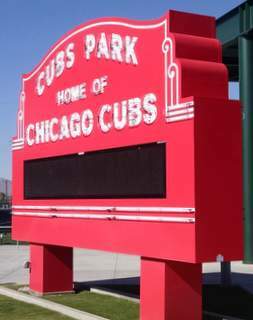 Where is the Cubs Spring Training? 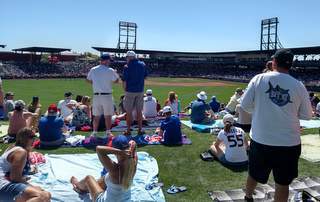 The Cubs Spring Training site is now in a beautiful new facility in NW Mesa. We scored some tickets to the party deck on the top. 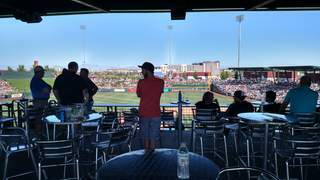 The game was at Sloan Park. It was impressive. The old facility was fine but this one is magnificent. They have the same kind of close-to-the-action seating as the last place but WOW this is some kind of ballpark. It was a fine warm day in Mesa, really beautiful. Temp was in the 80’s. Back in Chicago that same day the temperature was in the 40’s. Eeeek. People looked at others and were thankful it was so nice here. Anyway the parking is mostly going to be overflow on some grassy fields next to the ballpark. There is lots of room. Even saw a car dealer with a sign for free parking. We paid a little more so we didn’t have to walk too far. Even then the walk is fast through the paths then the gate. Then when you come into the ballpark you can see the grassy areas in the left and right outfields where you can claim your territory and watch. Looks real comfortable but the sun can get blazing hot so you might want to bring a hat and sunscreen if it is a warm sunny Arizona day. 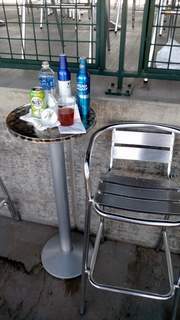 We took a few pics on the way to the party deck. The seats on the top deck are comfortable and spacious. Best thing is you can get up and walk around and not have to crawl over anyone. Like go to get food at the rolling buffet. Or get some adult beverages. Nice and relaxing. Top deck seating is in the shade which is a good thing on hot days. When you are done with the game be sure to check out the features of this new park. Like the marquee that is reminiscent of the one at Wrigley field. Nice job! Then on the way out you can get your fix with memorabilia. 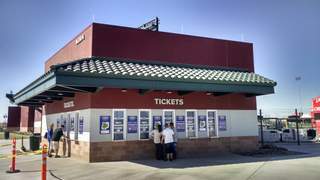 You can order your tickets online, try http://m.mlb.com/chc/tickets/spring. Suggest you get them early because the games can sell out. Or get the tickets on site. 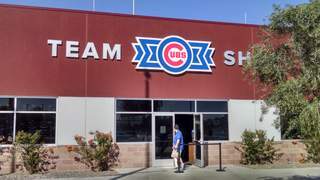 Where is Cubs Spring Training?